The list of the ‘Papists of the Parish of Kildress 1766’ shows that out of the 22 Catholics in the townland of Dunamore, County Tyrone, eight were O’Monaghans (there were no O’Monaghans elsewhere in the parish). These people, it seems, were heads of households, as the only women listed are widows, who would have been the heads of their households. There were three McGeraghtys in the townland of Strawmagilmartin*, and one in the neighbouring townland of Beagh More (and none elsewhere in the parish). As is shown below there’s little doubt that our ancestors were amongst these Monaghans and McGeraghtys but at the moment it’s not clear which of these people were our direct ancestors. We’re lucky to have this information as most returns of this religious survey, which was carried out by Church of Ireland vicars on the instructions of the government, have been lost. Two 19th century land valuations of Kildress parish give details of people renting (or owning) land in Dunamore. In 1823 the Composition Act specified that tithes to the established church should now be paid in money, rather than in kind. Tithes were a great bone of contention as they had to be paid by the entire population including Catholics and Presbyterians, not just by members of the Church of Ireland. The Tithe Applotment Survey of December 1827 and Griffith’s Valuation of Ireland of 1860 show a concentration of Monaghans in the townland of Dunamore, and of McGeraghtys in the nearby townland of Kinnagillian. Both these surveys list only those individuals, usually heads of household, who rented land. The T A Books reveal the land in Dunamore to be poor. Due to the destruction of many Irish records, including all the census returns up to 1901, these land surveys are of great importance to those tracing their family history. The Tithe Applotment Survey of 1826 showed 40 people renting (or owning) land in Dunamore; ten of these were Monaghans. It seems the surname had been modified from O’Monaghan to Monaghan. There was a Michael Monaghan (not our Michael who would only have been 11 in 1826), Francis Monaghan (possibly Michael’s father as he named his eldest son Francis), two Peters, two Patricks, a Widow Monaghan, James, John, and a Bartholomew Monaghan. It seems fairly unlikely that either Peter or Bartholomew were direct ancestors as neither of these names crops up in any subsequent generation of our family, though they do occur in Monaghan families found in Berry Edge and Port Clarence. *A book on the Surnames of Ireland refers to the Gaelic surname Mac Giolla Mhartain - follower of St Martin; I wonder if this forms part of the derivation of Strawmagilmartin? Censuses began in Ireland only in 1821 and none was taken in 1881 or 1891. The returns for 1861 and 1871 were destroyed by government orders and most of those for 1821-1851 were lost in the 1922 fire during the Irish Civil War. An Old Age Pension for Senior Citizens was introduced in Ireland in 1908 and, to verify claimants' eligibility from 1910 to 1922, officials at the Irish Public Record Office abstracted information from the 1841 and 1851 census returns onto "Green Forms" for government internal use. These Green Forms survive in the National Archives, filed by county and parish, for the families that were searched. The green forms give the following information about the Monaghans of Kildress. In 1841 amongst the Monaghan families in the townland of Kildress were Joseph Monaghan, and his wife Jane (her maiden name seems also have been Monaghan), James, 8 in 1841 made a claim for a pension at Dunamore in 1909. Charles Monaghan claimed a pension in 1916, this revealed that in 1841, when he was 16 months, he lived with his parents, Patrick and Bridget (Loughran) at Beleevna Beg, near Dunamore. Catherine Conway (formerly Monaghan) claimed a pension in 1921. Her green form shows her parents and siblings in 1851, Michael (35) and Bridget (23) Monaghan, Alice (9½,) James &, Mary (3), Bridget (2), and Ann (3 months) at Dunamore. Also in the district in 1841/51 were Terrance and Mary Monaghan and their family. Christopher Keenan and his wife Bridget (Monaghan), appear on the record of their daughter Ann Loughran’s pension claim; Christopher and Bridget of Meenanea had a number of children baptised between 1837 and 1849 at St Mary’s Dunamore. In 1828 a school was opened at Dunamore and in 1834, teaching the 39 pupils (including eight girls) was Mick Monaghan, who was paid £4 0s 0d every six months. In 1834 Joe Monaghan was commissioned to provide a new name board for the school. In February Terence Monaghan submitted a petition on behalf of parents, criticising the conduct of the school under Mick Monaghan, who was allegedly absent from school three days a week running a shop. By 1 September 1838 John Monaghan had been installed as a school master; he was apparently a most competent school master. In the 1880’s John J Monaghan was the school master, assisted by his sister Kate. In November 1869 an Anne Monaghan, ‘the widow of Michael Monaghan, school master’, died at Stockton St Middlesbrough*, in 1851 she was the head of a household of six at 167 Berry Edge, (Consett, Co Durham). The census of 1891 shows her children were born in Kildress. St Mary’s Blackhill baptism register shows her maiden name to be McNamy. The GVI survey of Dunamore in 1859 shows several McNamees in the area. The Kildress parish register can be viewed on microfilm at the Public records Office of Northern Ireland in Belfast. The quality of the ink, the handwriting and poor standard of filming make this register difficult to read. Also Irish registers of this period often offer less information than their English contemporaries and this register is no exception, the parents of the brides and grooms are not recorded, though the townland they lived in is; the names of the sponsors hint at the kith and kin of each of the families. In 1835 Patrick Monaghan, son of Joseph Monaghan and Janet (Loughran) of Dunamore, was baptised, sponsors Joseph Monaghan and Bridget McNamee. The tower (absent from the old photo below) was added after the church was built. Family tradition has it that Michael Monaghan; (my great great Granda) came from Cookstown in County Tyrone. We know from tracing the family back through English civil and catholic church records to the 1851 census of England that Michael was born around 1816 and that my great great gran, Hannah McGeraty, his wife, was three years older than him, and that their first child Bridget was born around 1846, all in Ireland. The parish register of Kildress Catholic Church, St Mary’s, Dunamore (about eight miles from Cookstown, just north of the Cookstown to Omagh road) records the marriage of Michael Monaghan to Honora McGeraty on 29 January 1846, witnesses Charles Mulhatton and Alice Monaghan, Dunamore. Michael and Hannah’s first child, Bridget Monaghan, was baptised on 20 October 1846. This accords with the information on the 1851 Census for Berry Edge (Consett) and confirms this is ‘our’ Monaghan family*. The sponsors at the baptism were William Monaghan and Sarah D.....*(illegible) it is likely that William, the child’s godfather, was Michael’s brother. The family were living at Dunamore. Because the names of the fathers of the bride and groom were not recorded in the parish register (contrary to the practice in England), it’s not possible at the moment to positively identify our earlier ancestors. However, based on the subsequent naming of the Monaghan children**, Michael’s father may well have been called Francis, perhaps the Francis Monaghan who appears on the 1826 returns (plot 2). Michael’s mother could well have been called Mary. Similarly Hannah’s parents were likely called William & Bridget McGeraty. The parish records for Dunamore Catholic Church are available on microfilm at the public records office of Northern Ireland in Belfast. Before finding these records I had checked five other Catholic Parishes in the area without success. **In the past children were usually named after their grandparents: first son - paternal grandfather, first daughter - maternal grandmother, second son - maternal grandfather, second daughter - paternal grandmother. On 1st December 1847 an Alice Monaghan of Dunamore married Peter Cassidy. The witnesses were Edward and Patrick Monaghan. It is very likely that these people would have been relatives of Michael Monaghan, possibly brothers or sisters, or perhaps cousins. 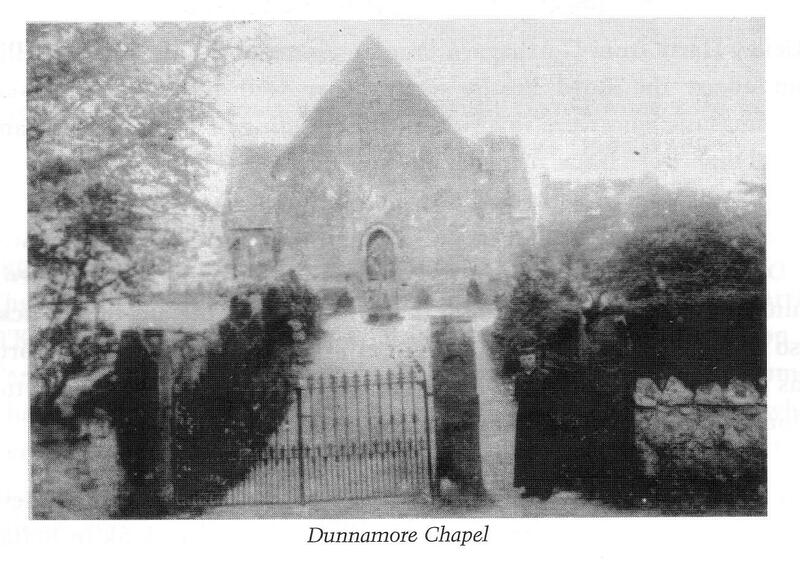 The following baptisms took place at St Mary’s Dunamore. Patrick and Ann (McGarrity) Corey of Beltonanean had a number of children baptised in the period 1879 – 1893. 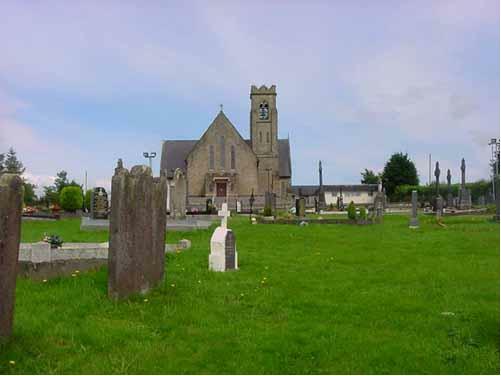 Patrick and Bridget (Monaghan) Donley of Dunamore had their son Michael baptised on 30 Sept 1836. Patrick and Margaret (Monaghan) Donnelly of Dunamore had their children baptised, Catherine on 24 January 1849 and Margaret on 18 Sept 1842. Francis and Bridget (Monaghan) Keenan of Dunamore had three children christened between 1854 and 1865. James and Mary (Monaghan) McHugh of Dunamore had three children baptised between 1832 and 1853. Patrick and Catherine (McGarritty) McKenna of Killucan had six children baptised between 1836 and 1852. As with the people referred to earlier it’s not known how or if these people were related to our ancestors, but as well as sharing surnames with then they lived in the same small area as our Monaghans and McGerritys and it seems very likely they were related. The 1901 census of Ireland shows a picture that had changed, but not as much as might have been expected. Twelve of the households in Dunamore were headed by Monaghans. Like the other inhabitants of the townland there was a general absence of people over 60. Approximately half of the Monaghans spoke Irish, though in a change from the position in 1833 they all could speak English. A high proportion of the people in the townland could not read or write. Everyone in the townland was catholic. The diet in pre-famine Ireland was limited; this account comes from Co Mayo. ’They had few cattle or sheep as they had little place to keep them. Most families owned a cow and a calf only and those near the mountain owned a few sheep each. The land supported the household for they lived on potatoes and, now and again, had oatmeal cakes and butter and milk. The corn was sold to pay the rent and taxes. Flax was sown, a few quarts by each farmer, out of which they made their linens, and wool provided the heavier clothing which also was made locally. similar Scene, I imagine, to that in Dunamore. 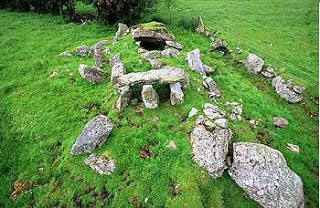 A feature of Dunamore are the neolithic graves in the area. The nationalist newspaper, 'The Nation' reported the handing over of a donation of 5s at a repeal meeting in Dungannon by Mr Barker of Kildress, from the 'thoroughly nationalist people of his parish' (30 November 1844. At the same meeting Mr Michael Keilty also handed in 5s from the parish of Kildress. 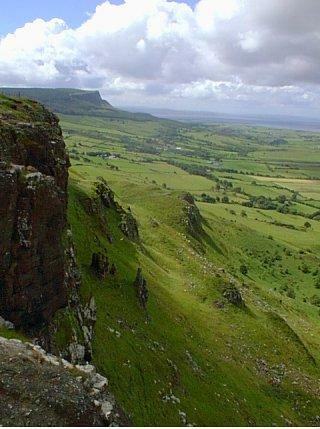 The Sperrin Mountains, just north of Dunamore. Emigration to England, and return to Ireland. ...A malignant fever has broken out at the work house of Dungannon, County Tyrone. A great number were dying. The physician was carried off by it in nine days, and the last account states that the master and the mistress were both ill of the same disease. It is called a black fever. Shortly after Bridget’s birth her parents decided they had to leave Ireland (where over a million people were to die of starvation over the next few years). The country’s population, which had risen to 8.2 million by 1841, was almost halved over the next 50 years. The population of Kildress parish, which totalled 7,600 in 1841, had dropped by 15% to 6,400 by 1851. By 1891 there were 4,500,000 people in Ireland, and 3,000,000 Irish-born people outside of the country. Numbered amongst these were all the known ancestors of the Monaghans, the Corrs (and the Burns). 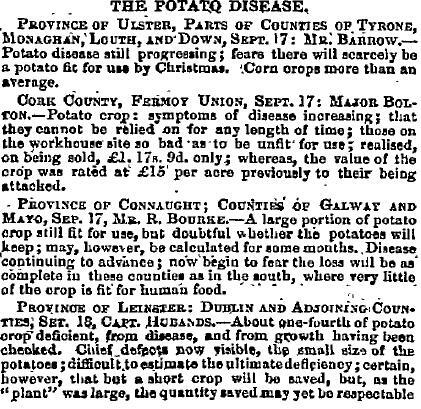 The Tyrone potato crop had partially failed in 1845, and a year later it failed totally. 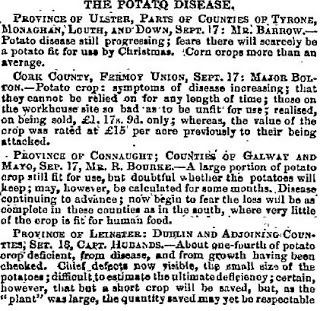 The potato was the staple food of most of the population, and famine combined with heavy snow from November to February 1846 to make the situation even more serious. Sometime between October 1846 and 1848 Michael Monaghan and his family sailed to England, likely to Whitehaven, and then probably walked towards County Durham. The rail fare from Carlisle to Newcastle at 1841 fares was 11s in a closed, or 8/6d in an open car, a miner earned £1 (20 s per week). The most direct route from Cumbria to Durham was over the watershed at Alston and down Weardale. The 1851 census shows a house with many Irish boarders at Nenthead at the top of the dale. Despite this there were few Irish inhabitants in the upper dale, as the organisation of the lead mining industry did not lend itself to the employment of newcomers, I assume the Nenthead Irish were in transit across the pennines. * Continuing down the dale Irish travellers would have found themselves in Wolsingham and then in Tow Law. Perhaps the Monaghans had friends or relatives who were already in Durham, and knew work was to be had there. By October 1848, carrying a small baby, and with another on the way they had covered the 40 miles to Tow Law, a booming** iron, coal and coke town, which was becoming a magnet for people arriving from Ireland. ‘Thornley’ was expanding by 1842; there was a valuable coal field and the new rail connections (there was an appeal to raise funds to build a church in the Newcastle Courant of 4 Feb 1842). Charles Attwood had set up a major Iron works in Tow Law in 1845. 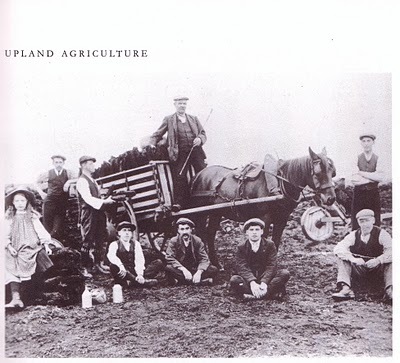 *Lead mining was carried on by local families organised in self employed partnerships, there were no wages, the men were paid for the lead they produced, they were paid only once or twice a year, incomes were a fraction of those in the collieries, and survival was only possible if the families had access to farming land which was worked by the wives. **Tow Law’s population grew from 30 in 1841 to 1,930 in 51 and 4,978 in 1861. The population of the town dropped after the closure of Attwood’s Iron works and his Engine works in the 1880s. Will meet with Liberal Wages. Advert in the Newcastle Courant of Friday 13 February 1846 illustrating the grown of the town. *Tow Law Durham Miner Project website. ** However the bank took no payment for it’s efforts and –‘the British Association for the Relief of Extreme Distress in Ireland and Scotland, founded by Stephen Spring Rice, Lionel de Rothschild and Thomas Baring (of Baring's bank) in January 1847, raised huge sums of money from the generosity of the wealthier classes in England’. Rev Donal Kerr. VCCS ‘The Catholic Church and the Great Famine’. 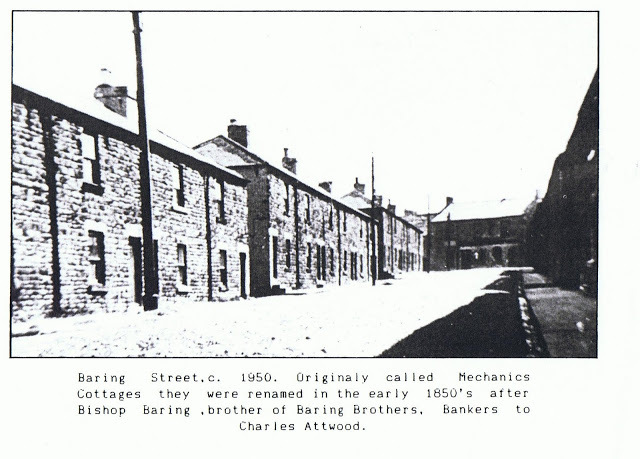 In 1851 over half the people in Mechanic’s Cottages at the south end of the town had just arrived from Ireland and in Wolsingham Parish 265 out of a population of 4586 or about 5% were Irish born. The census gave the counties of origin of a very small sample of the Irish population. There was 1 person from Co. Antrim, 3 people from Co. Armagh (including 2 from Carrick – likely Carrickfergus), 2 Down, 2 Dublin, 11 Fermanagh, 2 Galway, 5 Louth, 3 from Co. Monaghan, 4 Sligo, 1 Gerrvagh Parish, on the Co Sligo – Co. Roscommon border and just 1 from Co. Tyrone. The prominence of Louth, Armagh and Monaghan this small sample indicates a similar picture to that in Consett at the time of the census, however, the registers of St Thomas Wolsingham and Brooms Leadgate show that there was a significant presence of Tyrone people in the area, many from Kildress and Dunamore. St Joseph’s Catholic Church, Tow Law, was not established until 1867 and St Thomas of Canterbury, Wolsingham, had been established in 1849. Despite checking the baptism registers for Brooms and Esh Laude Mary’s baptism has not been found. It has been suggested that she may have been baptised at Bishop Auckland, though this is quite a long way from Tow Law; anyway, the early records of St Wilfred’s, Bishop Auckland, have been lost. Francis’ birth certificate records that he was born on the 30 August 1850 at Mechanic’s Cottages. Francis’ birth was reported on 26 September that year. Francis’ surname was recorded as Monighin, and Hannah’s maiden name Garity. Francis was baptised at St Thomas of Canterbury, Wolsingham on 8 September 1850, and his date of birth is recorded as 31 August. The sponsors were Michael Quinn and Mary Whittonhall. Mary Whittonhall was the housekeeper to Thomas Wilkinson the Catholic priest at Back Lane off Angate Street in Wolsingham. There were two Michael Quins in northwest Durham at the time of the 1851 census, both Irish as one would expect. One was an agricultural labourer at Ford, near Maiden Law, Lanchester; the other was a blast furnace labourer, one of a mainly Irish household at Dan’s castle Tow Law, which also included two Locherans, like Quin, a common name in Kildress, the home parish of the Monaghans, in Co Tyrone. It seems quite likely that Francis’ godfather, Michael Quinn, came from the same Irish parish as his parents. The dates of birth of Mary and Francis suggest the family was in Tow Law for at least two years, moving to Consett between the autumn of 1849 and the spring of 1851 when the census was taken.